Watch Free Tampa Bay Buccaneers Practices – Where Did My Brain Go? Karen and I watched the Tampa Bay Buccaneers practice on Sunday. 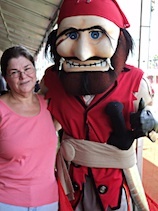 That's Karen in the photo with Captain Fear, the team mascot. Captain Fear has a cute story, similar to the mythical tale of José Gaspar, the pirate whose annual invasion of Tampa leads to the Gasparilla Parade. Captain Fear supposedly lives on a boat that is parked near the practice field, and is part of the Gasparilla parade. Captain Fear was remarkably energetic and cheerful, despite wearing a costume which seemed to have been designed for a winter game with the Giants. Today was a semi-typical Tampa Summer day. The temperature reached 90, but it did not rain. I was surprised that some players and coaches wore long sleeves. Our view of practice. Do you want to see this? Practices are held at One Buccaneers Place. Map: 3302 W. Martin Luther King Jr. Boulevard. Take Dale Mabry to MLK and turn East, toward Himes. Only one parking lot entrance is open. I found the entrance by following traffic. It was crowded. We arrived at 2:15 for a 2:00 practice. Bucs were practicing passing near the entrance of the seating area, and running near the far end. We sat near the far end. Most seats were taken when we arrived. It was hard to see the passers. Parking is free. If you carry a bag, it will be searched. Karen carried a drink through security, but you can buy cold drinks. You can also buy season tickets, and lots of stuff with a Bucs logo on it. The Bucs were distributing cold towels from an ice bucket to players. Karen and I want to do something similar. We will bring ice packs and towels next time. The parking lot opens 90 minutes before practice. Get there early for more seating choices. You might want to leave a few minutes early, after you feel the heat and see the crowded parking lot.